Do you, I’m wondering? I’d love to find out what other writers do. I’ve written six novels now. Three are as yet unpublished and I’m starting the rounds next month for my sixth. Strangely though, I’ve only ever cast one of my novels with “real” actors as opposed to descriptions in my head and on the page. Why is that? I’m not sure except to say that the only one I have cast, is set in contemporary times – 2004 to be exact and I don’t think that is a co-incidence. In Crossing Paths there are eight main characters and they all have approximately 20,000 words each, which is a lot of “air” time. My main character Jane Townsend is the beautiful but fragile Rose Byrne. I just couldn’t imagine anyone else playing the role although she is in her thirties now whilst my Jane remains (in the inimical way of fictional characters) still in her twenties. John Cusack is Jeremy Braithwaite. No-one else will do and the same goes for the psychic medium and retired librarian Ruth Moon. 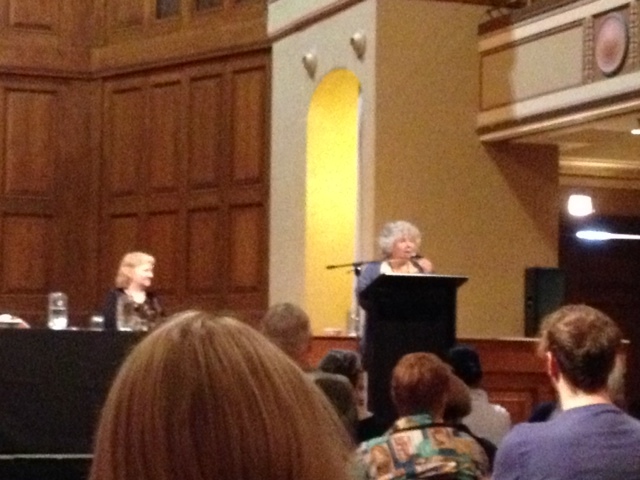 She is none other than the indefatigable Miriam Margoyles who was part of Newcastle’s inaugural Writer’s Festival and did a brilliant and very entertaining Catherine de Bourgh for the discussion panel (see pic above) celebrating 200 wonderful years of Pride and Prejudice. When you are picking actors to play your characters I think it is essential to aim high. Don’t bother with B grade, inexperienced actors. Grab the stars and that’s just what I did for my characters, particularly Mary Darling. Mary has just changed her surname and decided to run her family home on Vancouver Island as a B & B at the start of Crossing Paths. She is an excellent cook and the perfect person to run a B & B – she just doesn’t know it yet as she is lacking self confidence. Now I know Meryl Streep likes a challenge. Here’s one for her! Play a woman who is shy and seriously lacking in self confidence! Not sure I’ve ever seen her do that! In Cornwall a gay, New Age writer is looking for love and I pretty much envisioned Rupert Penryn-Jones in the role of Jonathan Fairlight. His widowed mother and new bookcrosser Daphne is not one of the eight main characters but I’m sure Helen Mirren would have fun with the role, particularly with her new friend Miriam Margoyles aka Ruth. Have they ever acted together? I don’t think so. Now the last three characters I didn’t actually cast but that was because suitable actors, I believe, are in abundance for those three roles. A pretty Greek actress who has rudimentary English for Eleni, a sophisticated French actor in his late fifties for Pascal, a French biographer. And lastly a good looking, enigmatic African American actor in his thirties for Russell, a Boston bookshop owner. Too easy! As for my other novels – my first I don’t think it entered my head to chose actors. It was enough to actually be writing. My second unpublished novel was peopled mainly with my ancestors so it was kind of impossible to make casting decisions. As it was I used my family tree to create the extensive family histories of both the Kittos and the Wearnes and as a result I have messed up my knowledge of actual facts. I’m no longer an expert on our family on my father’s side! Fact and fiction has been irreparably combined in my mind. For my third unpublished book I was dealing with two sisters from two different times . Both sets of sisters – one beautiful and one plain were inspired by a photo of two sisters from the thirties and with these real women in my head, there was no way my mind was going to make the leap to actors. And I think that’s as it should be. Likewise my first published novel, Tomaree was also inspired by real people so apart from studying the physical appearance of a real US Serviceman and creating a character around some aspects of him and making my female character a redhead, no one came to mind! For my last novel, the recently completed manuscript of The Grey Silk Purse no actors have put up their hands. I’m of the belief too that it is often a good thing (particularly when the past is concerned) to let the reader reconstruct the appearance of characters. I’ve had a lively discussion on the subject with Matthew Ward of Mary Celeste Press as to the pros and cons of putting a real person’s face on the cover of a book. If there is no face, the reader can choose a suitable actor if they want to. Or they can decide on a full description in their head (from a few details supplied by me). Either works but it is fun as a writer (when it does happen) to play along with a real life actor, give them exciting action and dialogue and watch a novel spring to life with their help! 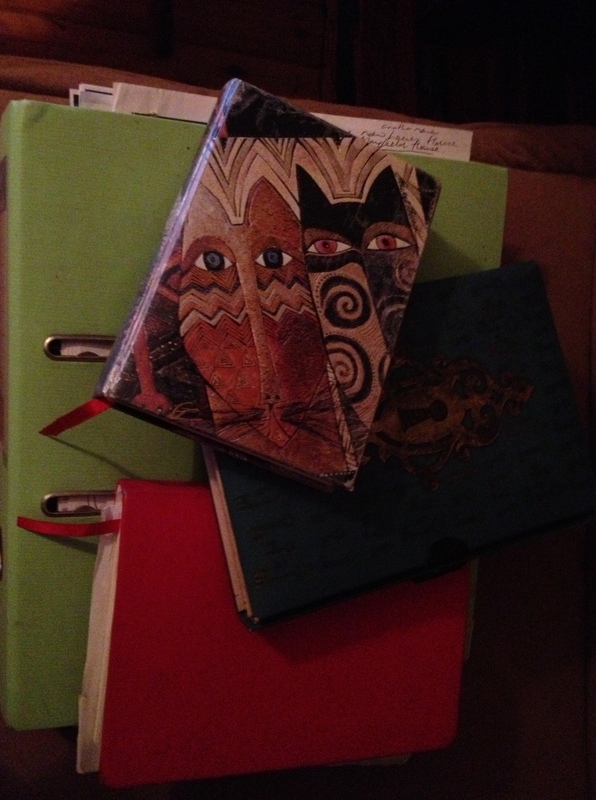 Here are four of my six notebooks for my current work in progress. 1) What is the working title of your current/next book? My current work in progress is entitled The Grey Silk Purse and is set in 1917/1918 Serbia and Mayfield, Newcastle in 1920/1930. I kept the name Miss Summerville but couldn’t find Carrington Chambers. Somehow I made the jump from there to my current project. Strangely I have no idea for this one. I cast Crossing Paths though. The main characters were played (in my head) by Rose Byrne, John Cusack, Rupert Penryn-Jones, Miriam Margoyles and Helen Mirren (in an uncharacteristically timid role). It is January 1920 and Miss Summerville living in a beautiful house in Mayfield, Newcastle begins a diary detailing how, after a long illness, she has woken up and can’t remember the last two years of her life. I hope to finish the manuscript very soon. (I’m on the second last draft now.) I’m determined to find an agent and a mainstream publisher and that is my goal for 2013. Much longer than Tomaree. Approximately two and a half years. Heroic Australian women from both world wars, including Olive Kelso King, Alice Kitchen, Vivien Bullwinkel and Nancy Wake. Hopefully the wonderful Scottish Women’s Hospitals who ran 14 field hospitals during WWI. Many of their doctors, nurses and orderlies were Australian, including Stella Miles Franklin who worked at the Ostrovo Unit in Serbia, the unit featured in The Grey Silk Purse. I love researching the 20th century and finding those small but relevant details that can make the past come alive. A soul telling your mind what your heart bleeds for.